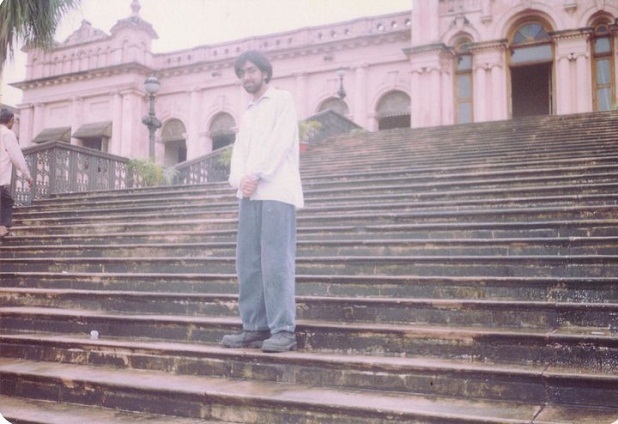 For the past half decade, Talha Ahsan, a bright young Muslim poet with Asperger's has been held in a maximum security prison, to be extradited to the US for offences that have never been clarified or proven. Author Nafeez Mosaddeq Ahmed charts Talha's tragic, ongoing plight and places it in the wider context of a rising (in)security state. 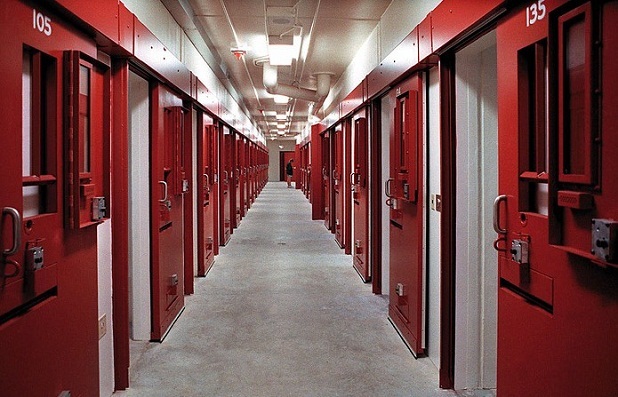 Nine days from now comes another anniversary – much less well-known, but nevertheless worthy of our attention – the five year anniversary of the detention without trial of a young British Muslim, Talha Ahsan. I first learned about Talha’s case around 2007, when I went to pick up my father and stepmother from their friend’s house in South London. It was late Friday evening, but I’d managed to find parking near the house. When the front door opened, I was greeted by a mild-mannered elderly gentleman, Mr. Ahsan. He led me upstairs to where my dad was already seated with his wife, and I was offered tea and a delectable assortment of Indian sweets by Mrs. Ahsan. My dad introduced me as an author and mentioned my then-new book, The London Bombings: An Independent Inquiry (Duckworth, 2006), in which I had challenged the British government’s account of its policies before and after the 7/7 terrorist atrocities. The topic immediately struck the interest of our host, and I quickly learned all about what had happened to their son Talha. Despite being very familiar with the history of US-UK counterterrorism operations and their often draconian and indiscriminate focus on Muslim communities, Talha’s case – and the fact that I’d never even heard about it in the mainstream press – shocked me to the bone. 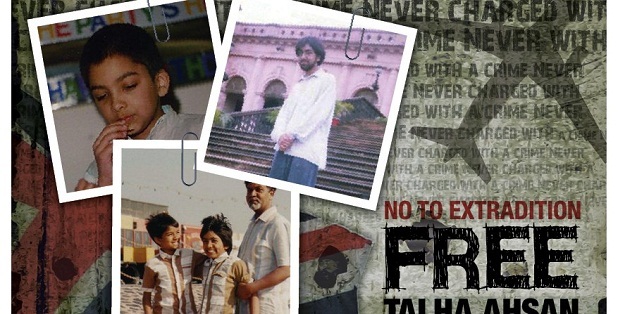 On 19th July 2006, Talha had been suddenly arrested by British police at his home. That very week, he had several job interviews scheduled to train as a librarian – although diagnosed with Asperger Syndrome, Talha is an extraordinarily bright young man, who had recently graduated with first class honours from the School of Oriental and African Studies. Since then he has been imprisoned without charge. Talha’s arrest was made at the request of US authorities under the 2003 Extradition Act. Unfortunately the Act requires no presentation of even prima facie evidence that would back-up a charge. Instead, US authorities can simply issue a demand to their British counterparts, who on that basis can detain people indefinitely without charge or trial. Although never questioned by either British or US police, Talha has now been in prison for half a decade, although no effort has ever been made to prove his guilt, or to assess the US government’s alleged case against him. Whatever the details, it’s unlikely to be a very strong case. Ahsan is one among several Muslims in Britain accused by US authorities of involvement in terrorism-related activities, without a shred of evidence being provided. In all these cases, any investigations by British police and the Crown Prosecution Service concluded unequivocally that there was insufficient evidence to charge the suspects – let alone detain them indefinitely. In one case, the extradition process appears designed to conceal the dubious and dangerous activities of security agencies. Another Briton awaiting extradition to the US is Haroon Rashid Aswat. Officially, US authorities want him to stand trial because, they say, he was involved in helping to set-up a terrorist training camp in Oregon in 1999. But the extradition request came after Aswat was arrested by British police shortly after the 7/7 attacks, which they suspected him of masterminding. The arrest was based on extensive telephone intercepts between Aswat and the 7/7 ringleader Mohamed Sidique Khan, in the weeks prior to the attacks. When former Army intelligence officer and US Justice Department prosecutor John Loftus came on record confirming that Aswat, along with Abu Hamza and Omar Bakri Mohammed, had been on the MI6 payroll since 1996 to facilitate Islamist-activities in the Balkans, British authorities almost immediately softened their allegations that Aswat had masterminded the 7/7 attacks, and subsequently withdrew the allegations completely without explanation. Currently, Aswat is still awaiting extradition. One wonders why the US authorities waited so long until after the British detained him in connection with 7/7, before seeking his extradition for an alleged crime six years earlier. Perhaps it had something to do with the embarrassing notion, voiced by Loftus, that Aswat had entered and left the UK despite being on a terrorist watch-list before 7th July 2005 precisely because he was still under MI6 protection. In another case, that of Loffi Raissi, extradition appears to be nothing more than a politicized farce to prop up prevailing security narratives. An Algerian-born British resident, he was arrested shortly after 9/11, then released by British police without charge. Then suddenly he was re-arrested under a US extradition request, which alleged that he had provided flight training to four of the 9/11 hijackers. Consequently, the prosecution stated they might even seek the death penalty against him. But the case pretty much collapsed during Raissi’s extradition hearings, in which every US allegation against him and the evidence it was supposed to be based on, turned out to be either false, or wholly fabricated. In the end, the Court of Appeal released Raissi from all charges in early 2008, and condemned the police and CPS for abusing the court process on the basis of false allegations. Talha Ahsan is now in Long Lartin high-security prison awaiting extradition to the US, where authorities want to put him on trial for alleged terrorist offences – for which no evidence at all has yet been provided. US authorities accuse Talha of operating a series of websites between 1997 and 2004 – azzam.com, azzam.co.uk, qoqaz.net, and qoqaz.co.uk. These sites were allegedly used to recruit people to join Chechen and Afghan mujahideen fighters allegedly linked to al-Qaeda. US authorities also claimed that Ahsan helped to raise money for such groups by distributing books, videotapes, audio cassettes and CDs promoting jihad. But just as the accusations against Raissi turned out to be false and politically-motivated, there is no reason to assume the allegations against Talha will be any different. Even so, military resistance against foreign occupation is a right recognized in international law under the UN General Assembly 1960 Declaration on the Granting of Independence to Colonial Countries and Peoples. By that token, as long as it does not violate the international laws of war, Chechen and Afghan resistance to foreign occupation and material support for that resistance is legitimate. Admittedly, the matter is complicated by the increasing role that al-Qaeda affiliated operatives have played in these war theatres. Unfortunately, it so happens that this increasing role has coincided with US involvement. Indeed, rather than randomly targeting innocent Muslims, US authorities would better invest their energies in investigating how clandestine US defence funds have systematically supported Islamist terrorist activities in these very regions. Unfortunately, investigating authorities continue to display little interest in exploring how covert Western government sponsorship of Islamist militants has undermined national security. Meanwhile, as dubious foreign policies continue to aggravate hostility towards the West from the Muslim world, the rise of the security state continues to catch thousands of innocent people in its indiscriminate web. Talha Ahsan, and his family, are yet another set of unfortunate victims of an increasingly unaccountable (in)security state. But it doesn’t have to be this way. One way to challenge the (in)security state is to support the Free Talha Campaign supported by the Islamic Human Rights Commission. Enough voices can compel the authorities to take notice. Find out how to add your voice to the growing chorus here. Dr. Nafeez Mosaddeq Ahmed is Executive Director of the Institute for Policy Research & Development in London. 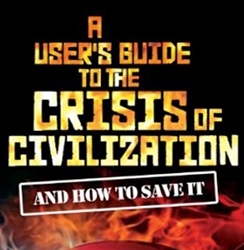 His latest book is A User’s Guide to the Crisis of Civilization: And How to Save It (Pluto/Palgrave Macmillan, 2010). He is the writer and narrator of the forthcoming documentary film, The Crisis of Civilization (2011). What a foolish analysis…. how sallow you could be when you think that a Muslim who Call for Khilafah and support Jihad and Mijahideen could have any relationship with Kufaar such as MI5 or MI6 or the British police or security …. grown up title bit is better for your future . Oh sorry, did I strike a raw nerve? Feeling a biit defensive about the latest slew of US-Saudi funds you’ve been siphoning off while you spout illiterate drivel and hatred? You should know that Talha is also a poet. His poems in prison, ‘This be the Answer’, were published by Radio Ramadan Edinburgh as part of their Taught by the Pen Festival in Feb 2011.